The newest accessory from BERNINA made its debut last week at our annual dealer event, BERNINA University – Patchwork Foot #97/97D, a quarter-inch foot designed especially for use with machines having a 7 mm-wide feed system such as the BERNINA 7 Series and 8 Series. It was a huge hit! Watch for them to be available in your local BERNINA store soon! 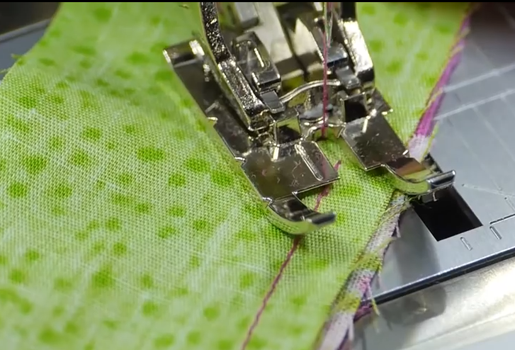 Here’s a short video about the new Patchwork Foot #97/97D with Patchwork Seam Guide, including markings for stitching perfect 1/8″ and 1/4″ seams. There is also a setting for 7.5 mm seam allowances, as used in Europe. Also included on this video is a tutorial on stitching mitered corners in patchwork blocks, such as those in Tumbling Blocks and Shadowbox quilt blocks. The same technique also works for home decor and garment projects. I have a Bernina 780. After doing some embroidery, I installed the 97D foot for piecing. No my machine is questioning the foot and does not recognize when I enter 97D. What is the alternate choice from the machine’s menu?